How to Make JioFi Wireless Network Invisible From Others? JioFi Hotspot is one of the most popular WiFi Hotspot available in India. Though the WiFi signal has WPA2-PSK encryption protection, we can do a little more. One of the extra precautions to avoid unauthorized access to your JioFi network is to hide them from other devices. Which means, no other devices will see your Jio Wireless broadcast while scanning for all available networks. This tutorial teaches you how to make JioFi WiFi invisible from others. Let us see how to make Jio WiFi invisible from the public and hide from potential hackers. It is very simple to make Jio Wireless Network invisible from other devices and prevent them from connecting to it. All you have to do is to disable the SSID broadcast from the GUI of Jio WiFi Hotspot. I suggest you connect JioFi router to your computer using the USB cable to perform it. 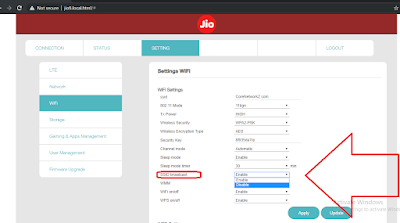 Once you have connected PC and the Jio router using a USB cable, follow the step by step instructions provided below. Type http://jiofi.local.html on the address bar of a browser and click the Login link. 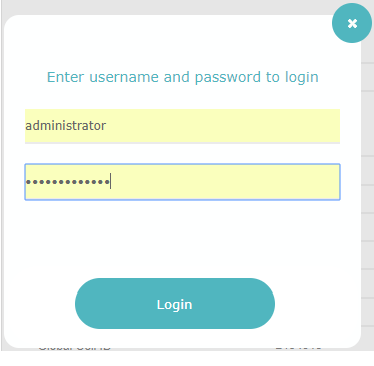 Use administrator as both username and password. Click on WiFi from the left menu. Click on the drop-down menu at SSID broadcast and select Disable. Click on the Apply button at the bottom of the window. Now the Jio wireless will restart. After the restart, no other devices will see this JioFi broadcast. Is Your Jio WiFi 100% Hidden? The answer is no. This invisible network will show as Hidden Network. However, no one without having the SSID (JioFi Wireless Network Name) can connect to this network. How to Change SSID and Password? How to Check JioFi Daily Data Balance Left In Your Account? So the external device must need both SSID and Passphrase to connect to a hidden Jio Network. It provides an extra layer of protection. How to Connect to a Hidden JioFi Network? 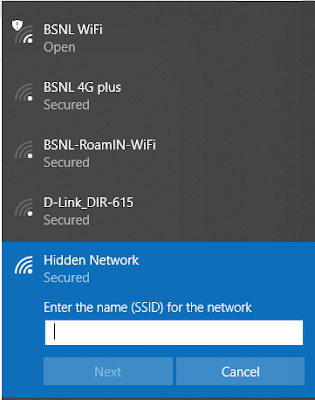 Once you have made the Jio 4G Hotspot WiFi signal invisible, you need its SSID to connect it. To connect to an invisible Jio 4G Hotspot WiFi, follow the instructions below. Click on the Wireless symbol on the system tray to scan all available networks. You will see the signal from Jio 4G Hotspot as one of the hidden networks. Click on the hidden network to connect. If there are multiple hidden networks, you can identify your Jio 4G Hotspot signal by analyzing the signal strength. You need to type the SSID (WiFi Name) to proceed. After typing the Password, you can connect to the invisible JioFi WiFi signal. Once you have made your JioFi signal invisible, no one can connect it without the SSID and Password. If you do not reveal the SSID to anyone, it will be difficult for someone to identify your WiFi. How to Analyze Windows 10 Local Hard Drive Storage Allocation? How to Keep Idea Prepaid Number Without Paying Monthly Rent? I hope you like this trick to add one more layer of protection to your JioFi network.